Is it time to order seeds yet? We chatted with experts to learn more about ordering, storing and planting seeds for the growing season. Gardening season seems far off with the ground frozen and temperatures below zero in parts of the country. But the gardening season is approaching and now’s the time to start considering which seeds to order. Are you ready? Here’s what you should know about ordering seeds so you can look forward to a successful planting season this year. The dead of winter in the north, and most of the country, is actually the most popular time to order seeds. “January is the busiest time for seed companies,” said Breanna Norris, a Facilitations Coordinator at FedCo Seeds. Preparation for the upcoming growing season is key, and Norris says in general, buying now is good for all kinds of seeds. Nick Libby, a Farm Crew associate at Johnny’s Selected Seeds agrees it’s important to start early to get a head start on the growing season. Certain types of seeds need to germinate in specific conditions before they can be planted outside, and not all conditions are the same. Some seeds need a lot of light, others don’t need much. Buying seeds ahead of time and germinating them properly means a greater chance of success when planting time comes. Steve Winterfeldt, a horticulturalist for Park Seed says it’s strange to say while a polar vortex is sweeping across the country, but prime seed time for people in the north is definitely now. 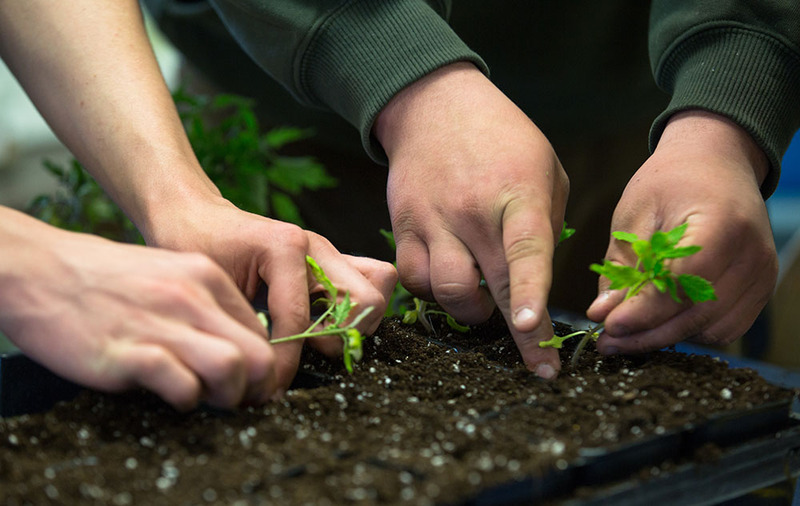 “Even though it’s the furthest thing from their minds, they need to start vegetable and flower seeds early for germination,” Winterfeldt said. According to Libby, storage specifications depend on the seed, but generally they should be stored between 40 and 50 degrees. “I keep mine in a shoe box in the basement of my house. As long as they don’t get wet, they can ordinarily be stored for a couple seasons,” Libby said. Winterfeldt suggested the fridge is a great place to put seeds people may not think about. Just store them in something airtight; a resealable bag or a jar with a lid are good options. Planting seeds also requires some forethought. Some plants have to first germinate inside to be strong enough to survive outside during their season.Their seeds have to be bought with enough time to be ready for planting in their season. It’s a good idea to use a garden journal to track when your seeds are planted and when they are expected to mature. When you should plant those seeds outside depends completely on climate, so in parts of the country where it’s warmer, they can start seeds earlier because they don’t have to wait for the frosts to dissipate, according to Winterfeldt. Up north, germinating seeds inside now means being able to plant them outside immediately as soon as the season begins. “Certain varieties of seeds tend to sell out faster. Greenhouse tomatoes are a big ticket item,” said Libby. Kerrie Wilson is a student at Husson University studying photography and journalism. She grew up in Maryland but wanted a change of scenery and chose Maine for its natural beauty. She’s had a green thumb ever since childhood; a current cat mom, plant mom in training. When she’s not writing or taking pictures, you’ll find her curled up by the window with a huge mug of English breakfast tea and a good book.